The Swedish perfumery Byredo has less to do with the whims of the fragrance market, or its trumped-up notions of fantasy, and more to do with the visceral quality of memories and ideas. For perfumer Ben Gorham, this is how it's been since launching the company ten years ago as an olfactory link to his native India. The unsolvable names of some of his scents are testament to this conceptual bent: Bibliothèque, Baudelaire, Inflorescence, and 1996, a collaboration with photographers Inez & Vinoodh. But his latest eau de parfum may his most far-reaching yet, a centennial tribute to WWI nurses on the frontline, who soldiers called the 'roses of no man's land' for their compassionate bravery in the face of desolation. 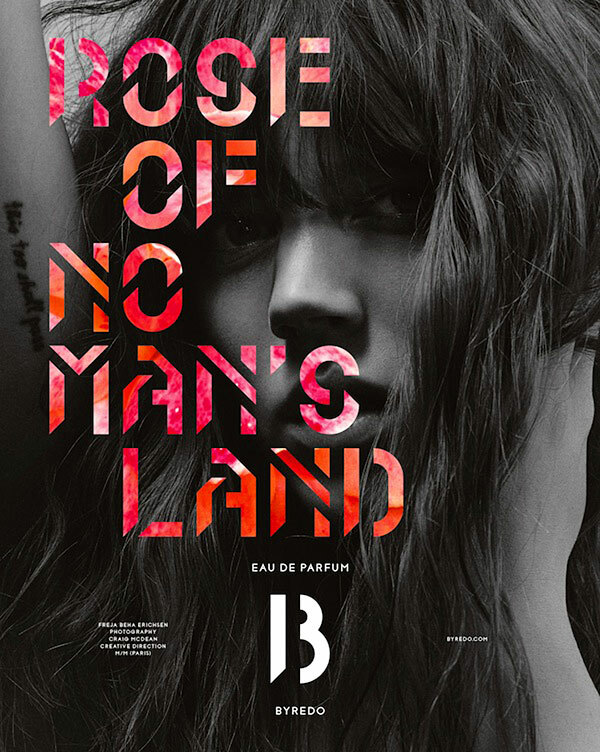 As such, Rose of No Man's Land, the fragrance, acts as a kind of soothing balm, a warming tonic — embodied in the Craig McDean-lensed ad campaign by model Freja Erichsen barely visible under a cascade of colorful letters. Notes of Turkish rose, pink peppercorn, white amber, raspberry blossom, and papyrus swirl together to form the scent's life-giving powers.